I love my new set. It was hard to decide between this one and another, so I bought both. It’s not super fancy but I love it. I will definitely reorder if I need to. The colors are perfect. Transform your master or guest bedroom into a luxury suite with this Avondale Manor Cherie Bed in a Bag featuring a plush microfiber construction for ultimate comfort. With a fashionable international look in a contemporary style, this bed in a bag will make a fashionable complement to almost any bedroom décor. Best of all, this bedding is machine washable for easy and convenient care and cleaning. The digital images we display have the most accurate color possible. However due to the difference in computer monitors, we cannot be responsible for variations in color between the actual product and your screen. I was excited to get this set but am truly disappointed in the quality. I wash the sheets and put them on my bed but only lasted 10 minutes as the sheets made my skin irritated. The sheets, pilllow shams and comforter is so thin that I put it against the light. I will never be able to use these sheets except for rags. I am extremely dissatisfied with this product and will no longer purchase items like this on Overstock. Would send it back but I don't think overstock will except them as I washed the sheets. TRULY DISAPPOINTED. This bed set is so pretty and so soft!!! I’m so in love with this!! It’s inspired me to redecorate my whole bed room! If I had to change one thing it would be the pillow cases. The Paris ones are too small for our pillows so I’m constantly having to fix them. But that’s a small price to pay for this amazing bed set!!! I love the colors. Brightens up my room. The pockets on the fitted sheet are smaller than described. The bedspread itself is small. More for a full size bed than a queen. Even though I bought the queen. The pillow shams are very small. I went out and purchased smaller pillows so they can fit. But I love the colors and design. 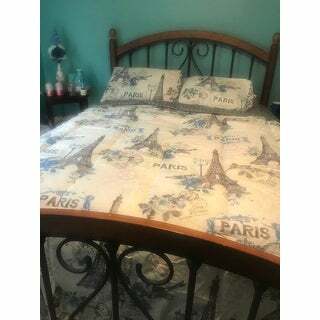 I bought this for my 9 year old daughter’s twin bed and she absolutely loved the Paris themed pattern. The comforter seems ripped on one side and will need to be sewned back, but other than that it was a great purchase. Love it looks so good in spare room!!! This is a beautiful set and really sets off my bedroom furniture, it is bright and cheery, the quality is excellent, and I get many compliments on it. It was perfect. My daughter loved the set and couldn’t wait to update her room. I have to say at this present time this bed set has motivated my daughter to keep her room clean. "does this set come with the throw pillows that are in the pictures? I ordered the coral set so is the comforter black or pink on reverse side, there are multiple color sheets and two different comforters?" "Will the queen size restock for coral ?" "Do you have this set in a twin? And if so, when will it be back in stock??" "Why is the king comforter same length as the queen size? It is too short.. I need at least 98" long." This is a nice comforter set for my college daughter. Very elegant and complete with the sheets. Hopefully when it arrives it will be Awsome! !